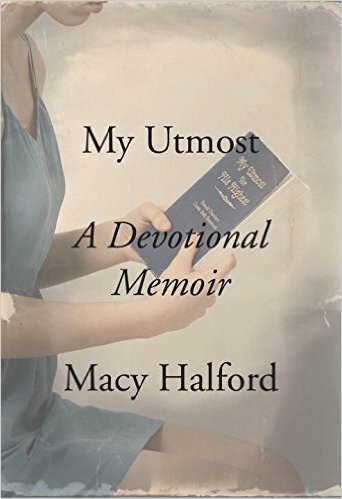 A memoir by a young woman from Dallas who moved to New York, exploring the Evangelical Christianity of her childhood and its meaning to her in the present through the classic daily devotional My Utmost for His Highest. Halford’s book is billed as a memoir, but it’s really an ardently told, diligently researched intellectual biography of Chambers ... My Utmost will be enjoyed and admired primarily by those who feel, as Halford does, 'a complicated nostalgia' for the evangelical faith they were raised in — those who can’t and won’t defend all the old doctrines but find that religion still pulls at them ... But those readers may also long for just a little more confession ... With My Utmost she reminds those of us who might have once dismissed Chambers as just another bewhiskered eminence that in this traditionless tradition there lives a man who read Balzac, Emerson, Nietzsche, Wilde, Dickens, Darwin and others with ferocity and humility, confronting dissent rather than hiding from it. ...funny, smart, literate — a journey, not into or away from religious belief like so many religious memoirs, but through that belief ... Hers is not a book full of coy skepticism. But neither does she rule out questioning, examining, re-examining and at times losing patience with what she has been brought up to believe ... All in all, it's a very contemporary spiritual journey: unfinished, unsure of its destination, looking back to a past that, if not lost, certainly seems to be fading. Halford makes little effort to tie up loose ends. What makes Ms. Halford’s experience unique is her continued daily reading of Chambers’s devotional even as she moves away from most (though not all) of her upbringing and evangelicalism ... Ms. Halford does a fair job of retelling the essential details of Chambers’s life, focusing on aspects that most appeal to her ... Ms. Halford admits that Chambers would probably not approve of her cosmopolitan life, and as the book progresses, the contrast between Chambers’s preoccupation with holiness and Ms. Halford’s focus on her relationships with men and making it in New York becomes stark. The book thus skirts what seems to be its central question: What does Chambers’s outward-looking, self-sacrificial life have to say to people today—right, left, Christian, agnostic—in an increasingly self-absorbed culture? What did you think of My Utmost: A Devotional Memoir?